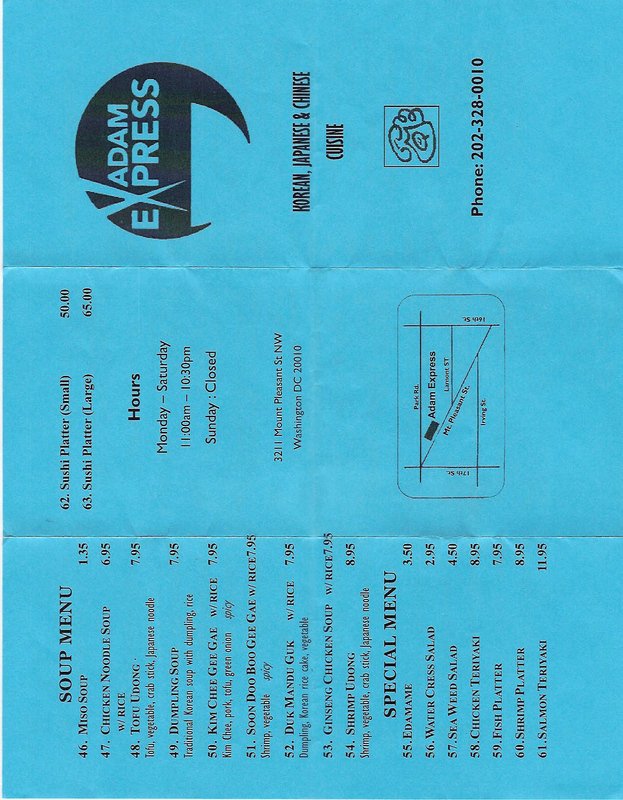 I went to Adam Express (Menu Side A and Menu Side B— click on the lower right hand box with the arrows so it makes the menu bigger) with a friend of mine to try out their food after reading so many great reviews. Food:When we first went, it was packed (umm, there are only 5 stools so it’s not hard to be busy). So we went to Tonic to grab a drink and then go back for dinner. Of course, I ordered bibim bap. It’s not like the kind you get in a restaurant, it was in a big bowl with a mixture of various vegetables and beef (so no clay pot). But I have never felt like I was in someone else’s kitchen as much as I did here. You could clearly see where they cooked and the ingredients they used to make their food. The husband and wife team were adorable and very nice. I really enjoyed the bibim bap, but it wasn’t like anything I had before in a restaurant — it was more like what someone cooks in their house. Service: As soon as we walked in, the wife took our order and two seconds later, the skillets were heating. Atmosphere: Calling it a hole-in-the-wall is spot on. As I mentioned, there are only 5 stools in the entire place and some are held together with wire. But the intimate setting is great for a quick, tasty bite. Overall: Perhaps you have a bad day and you don’t live close to home, but you want something cheap and good. You should go here. The couple’s warm smile and the intimate setting can almost make you feel like you’re home. Well, if your home is a place where Korean/Chinese/Japanese food is served. Regardless, it was good food at such a cheap price! Hours: 8:30 a.m. to 10 p.m. Monday through Saturday; closed Sunday. Is it just me, or do you hate to cook on Fridays? Well, I hate it. So before I left my office, I thought I’d call in an order to City Lights of China for pick-up. Although I’ve walked by it a million times before, I’d never ordered anything. Food: Don’t judge, but I ordered a lot of food from here because I wanted to try a little bit of everything (and I have a ridiculous amount of leftovers!). Anyway, I ordered their steamed meat dumpling, vegetable curl (with lettuce), crispy fried Cornish hen, and BBQ spare ribs (photos in order of list). The dumplings were really tasty — I think it was primarily a pork filling. With the soy-type sauce they included, it was perfect. The curl was a pretty big container full of vegetables and a good taste. The Cornish hen — wow. Even though I picked up my order, the Cornish hen was still crispy! The ribs were also fantastic. Service: I ordered on the phone, but they were polite. When you order for pick-up, you go straight to the back where the staff are located. It seems weird, but true. Also strange is that they didn’t include any silverware with the order. Thankfully, I have an apartment that has furniture, but what about those folks who stay in one of the local hotels? What are they supposed to do? Atmosphere: The interior leaves something to be desired. Overall: If you need to impress someone with the atmosphere and ambiance, this is not the place. 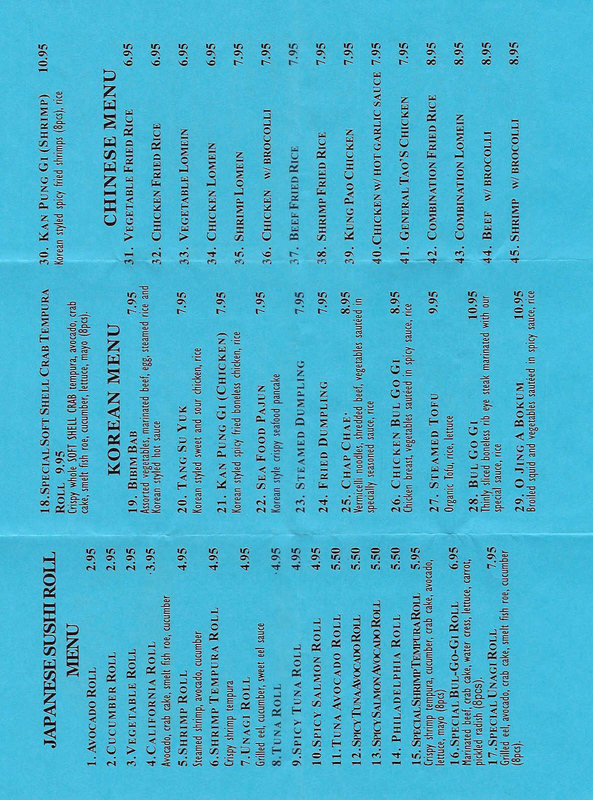 But if you’re trying to impress someone with Chinese food, go here. I thought all of the food I ordered was really good and there wasn’t a weak dish. I’m looking forward to going back and trying other items!